Pinterest is upping the game with its business products. Last week, it launched a new Gifts Feed. The Gifts Feed prominently displays various gifts Pinterest users can purchase- for others, or even themselves of course! The Gifts Feed only features Product Pins, a business product released last year and one that I wrote about here. Product Pins pull in extra information about a product, such as the merchant’s name, its price, and whether or not it is currently in stock. These pins sometimes even alert Pinterest users when a product pin they’ve repinned before drops in price. The idea of Product Pins is to increase the amount of sales businesses see from Pinterest. Thus far, Pinterest says they’ve driven high click-through rates. 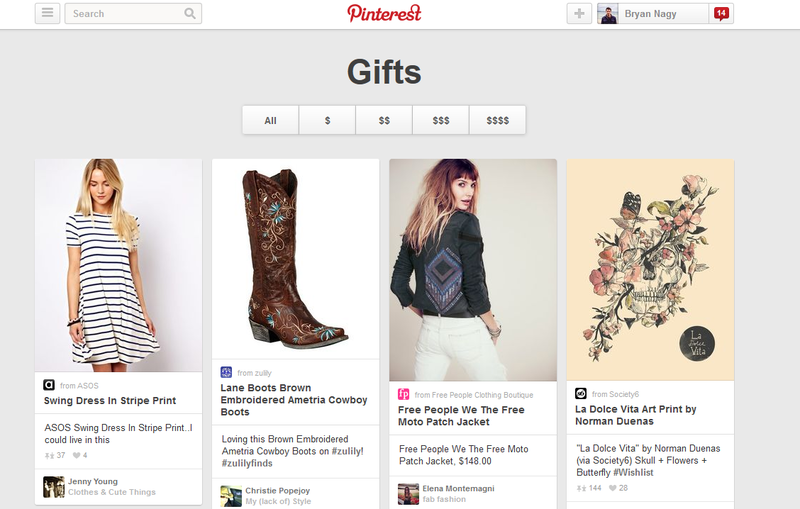 While the Gifts Feed is currently in “beta”, it is a great addition to the business product line from Pinterest. Pinterest users are able to shop for various products all in one place. The Gifts Feed even has a price filter which allows the user to select what price range their interested in..
What could make this even better? Letting users filter by item type, such as clothing, electronics, or home products. Even so, the Gifts Feed is a great sign of things to come from Pinterest for businesses! ← What are promoted brand magazines on Flipboard?